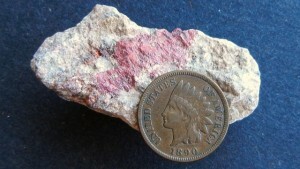 Cinnabar from Lake County. Photo by Andrew Alden. It’s widely known that California has a mercury problem unlike other parts of the world. We don’t produce it and we don’t emit much any more, but a lot of old mercury is still lying around from the mining days. How did that happen? In undisturbed nature, mercury is no more than a very local and very temporary problem. Mercury occurs mostly in sulfide compounds that are concentrated where ore-forming fluids invade metal-rich rocks. Cinnabar and metacinnabar are both mercury sulfide, HgS. Metacinnabar forms at higher temperatures. Metacinnabar from the Mt. Diablo Mine. Photo by Andrew Alden. 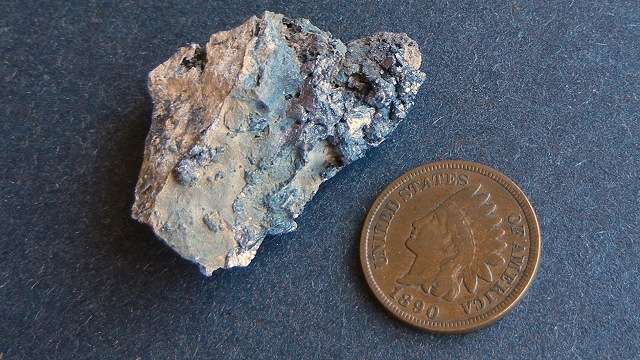 The California Coast Range was a natural place for world-class mercury ore bodies to grow. First, the range has a large amount of metal-rich rocks in the form of serpentinite and its parent rock, peridotite, derived from ancient seafloor. Second, these rocks were cracked and tilted as the Coast Range was built. Third, volcanic activity worked over these rocks, adding heat and chemically active fluids. Thus the source rocks were repeatedly mobilized, attacked and disrupted, a natural refining sequence that at each step concentrated metals. Serpentinite is a slippery rock that tends to attract faults, which in turn attract fluids. Hot deep fluids replaced the serpentinite with carbonate minerals like calcite, then again with silicate minerals like quartz. As veins of these minerals fan outward they carry mercury with them. Coast Range mercury was originally deposited at high temperatures deep underground, often associated with gold sitting a bit deeper. It remains for erosion to slowly uncover the ores. In coastal California, erosion is quite active as the Coast Range continues to rise. Wide zones of silica-carbonate alteration dot our mountains and host hundreds of mercury occurrences. The great New Almaden Mine, south of San Jose, exploited a deposit of this type. It was the largest mercury producer in North America, spawning the gold mining industry that followed the placer gold rush of 1849. Cheap, efficient mercury amalgamation was the key to gold production, and New Almaden mercury made it feasible. Volcanic heat also spawns hot-spring activity that can create mercury ore bodies, too. The McLaughlin Mine, north of Lake Berryessa, exploited a hot-spring type deposit yielding gold as well as mercury. Today the mercury mines of the Bay Area are all closed and being remediated. The New Almaden property is now a county park and the McLaughlin Mine is being carefully restored to a working countryside. Fortunately, mercury can be well controlled if acid mine drainage can be prevented, because cinnabar is poorly soluble except in strongly acid waters. At Clear Lake, the large former Sulphur Bank Mine is slowly getting under control. The privately owned Mount Diablo Mine, where my metacinnabar specimen was collected, is not a threat to spill into local streams although money is needed to fix it for good. Worldwide, the overwhelmingly largest source of mercury pollution is from the burning of coal. A much smaller source is from oil and gas. Mercury appears to ride along with oil and gas as they trickle from their source rocks upward into the reservoirs we mine for energy. In oil, mercury lives in the tiny metal portion; in gas, mercury is a vapor. Levels in both are in the low parts-per-billion range, although California’s oil tends to have relatively high levels. Mercury levels are highest in the dense fraction called petroleum coke, which is burned in place of coal. Even so, coal is far dirtier in terms of mercury, and the Bay Area is spared that insult. I know of al least one Mercury mine in Napa. A couple years ago, I developed a unit for my 8th grade science classes focusing on the history of the Hunters Point Naval Station, and the toxins left behind following its closure. This additional history focusing on another aspect/industry is very helpful.